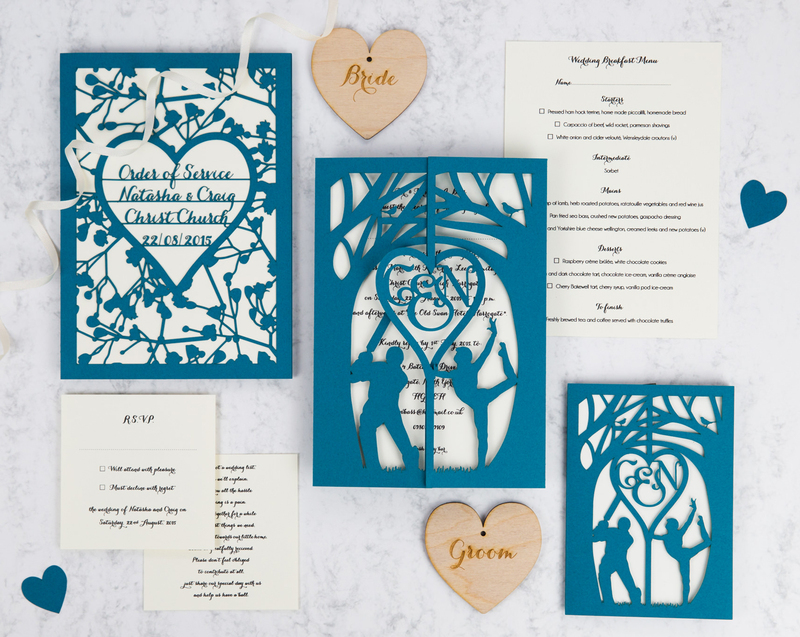 With 100 card colours to choose from and a design limited only by your imagination, we can help you set the scene with wedding stationery that’s as unique as you are. Whether you are looking for a bespoke design service or someone with the skill to bring your own designs and ideas to life, we’ll work with your budget to create something beautiful and memorable. 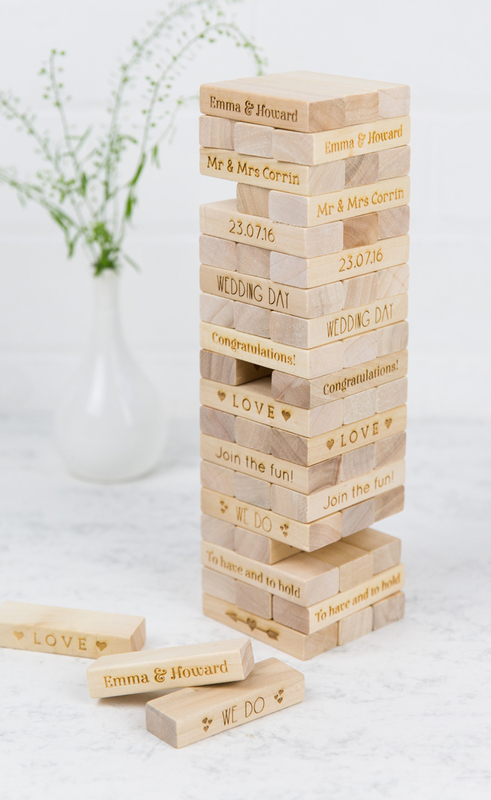 From save the dates and invitations to cake toppers and table plans, plus everything in between, we’ll add some laser cut magic to your special day! "Megan's attention to detail was nothing short of perfection. She took our ideas and made them come to life- we were so thrilled with everything. The extra element of personalisation achieved by working with such a creative designer added an extra special touch to the day. 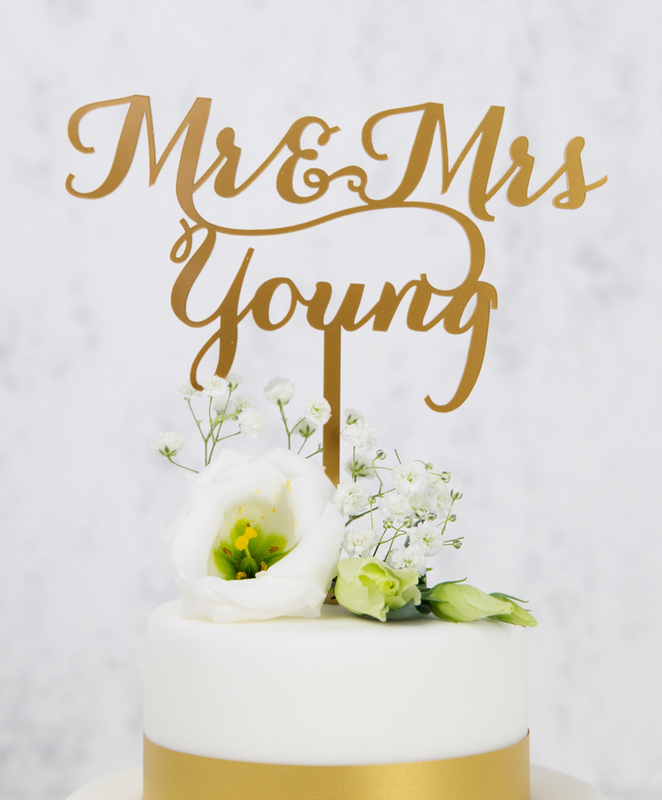 I wouldn't hesitate to recommend Megan to any couple looking for their perfect wedding stationery." What items of stationery can you create? We can produce a wide variety of items, including save the dates, invitations, R.S.V.P.s, orders of service, table plans, menus, table names/numbers, place names, guest books, favours, cake toppers, rubber stamps, thank you cards and more. What materials can my items be made from? 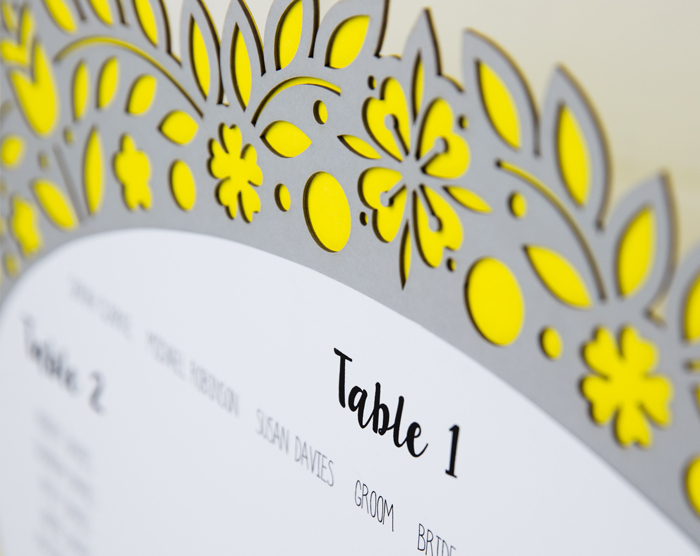 Most of our wedding stationery is produced from laser cut card and paper, however, we can also work with wood, Perspex and rubber. Can I have stationery made in any colour? 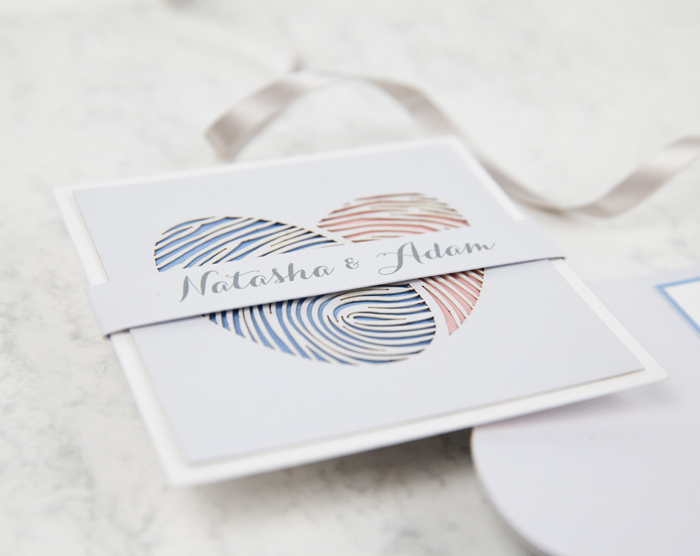 With a range of 100 card colours to choose from, we’re sure to have something to suit your colour scheme. Take a look at our colour selection to see the options available. Our materials list will show you some of the options available in wood and Perspex. Can my stationery items be in any shape and size? Within reason, yes, we are able to create items in any size and shape up to SRA2. For invitations and other items requiring an envelope, we would recommend sticking to one of our standard sizes- A5, A6, 150x150mm and 125x125mm. Can you produce purely printed stationery? 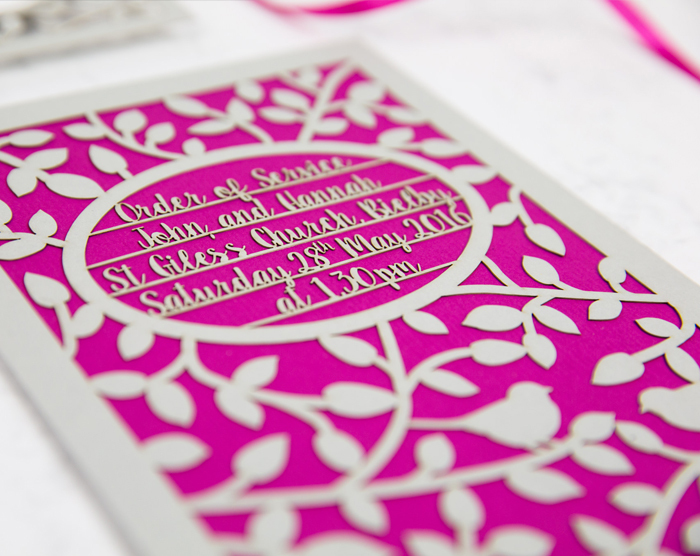 While we specialise in creating laser cut items, we can produce purely printed stationery. 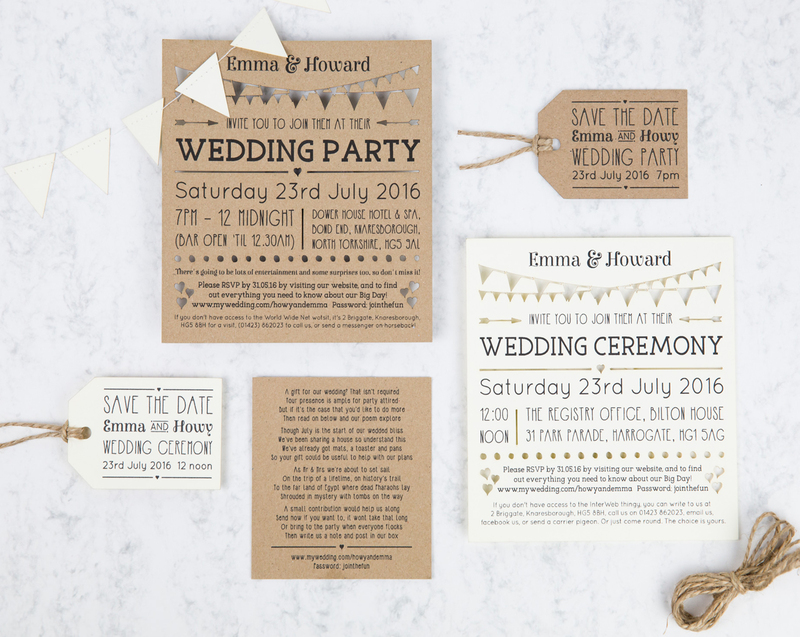 What do your invitations & other stationery items cost? As all our items are bespoke, we don’t have a standard price list. Once we have an idea of what you would like creating, we will put together a rough estimate before you decide whether you would like to proceed with an order. When and how do you take payment? For larger stationery orders, payment is usually divided into 3 stages. A £100 deposit is required once we have discussed your requirements and you have accepted our estimate and asked us to go ahead with the design work. A 50% payment of the remaining total is then due on completion of the design work and a finalised quote, before production can begin, followed by a final 50% payment upon completion of the stationery, before delivery. For smaller orders of individual items such as cake toppers and rubber stamps, a single payment is taken up front. Our standard payment method is via online bank transfer, but let us know if that’s difficult and we can arrange an alternative. The best way to get started is by filling in our enquiry form below. We will then guide you step by step through the rest of the process, but feel free to have a look at our process, timings and payment guide for more information. 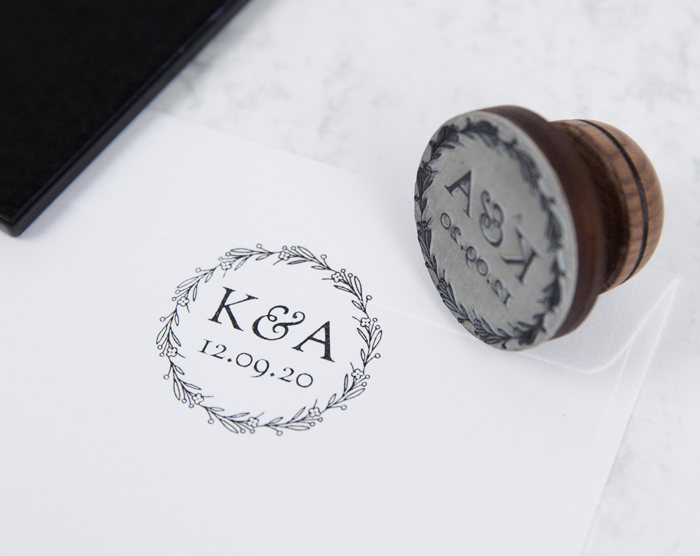 When should I order my stationery and how long does the process take? Save the dates, if being used, are usually posted around 1 year ahead of the wedding. Invitations, R.S.V.P.s and additional information will then follow 6 months or so before the day. For large orders of stationery we would recommend getting in touch at least 2-3 months before you require the items to allow time to complete the design process. For smaller individual products such as cake toppers and rubber stamps, 2-3 weeks is fine. Do I need to come for a face to face consultation? While we prefer to meet you in person to discuss your requirements, it’s not a problem if that’s not possible. We’re happy to discuss your needs over the phone or email instead. When can I come for a consultation? In-person consultations are usually held during our standard working hours (Monday – Friday, 9am – 5pm), however we can usually arrange to meet on an evening or weekend if required. Please get in touch via our enquiry form below and we will be in contact to arrange an appointment. Can I design my own stationery for you to produce? Of course! You are welcome to have as much or as little involvement in the design process as you wish. We can work with anything from a finished Adobe Illustrator file to a hand drawn sketch or simply a few inspiration images. Do I need to order all of my stationery items at the same time? No – in fact, we would recommend splitting your order into a few stages. Save the dates and/or invitations usually come first, followed by on the day stationery closer to the date of the wedding. Will I get to see a proof or sample of my stationery before production? Yes, digital proofs will be provided for all orders until you are satisfied with the design. For larger orders of items such as invitations, we’ll give you the opportunity to see a full physical sample before we go ahead with the work. 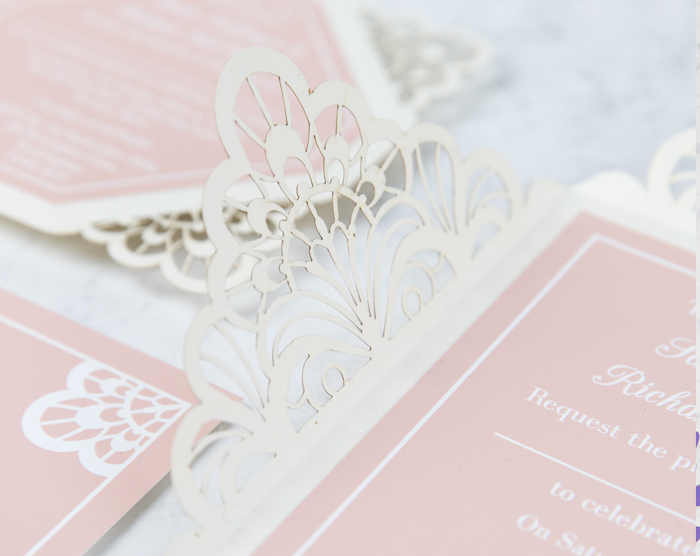 Do you have a minimum order for invitations? 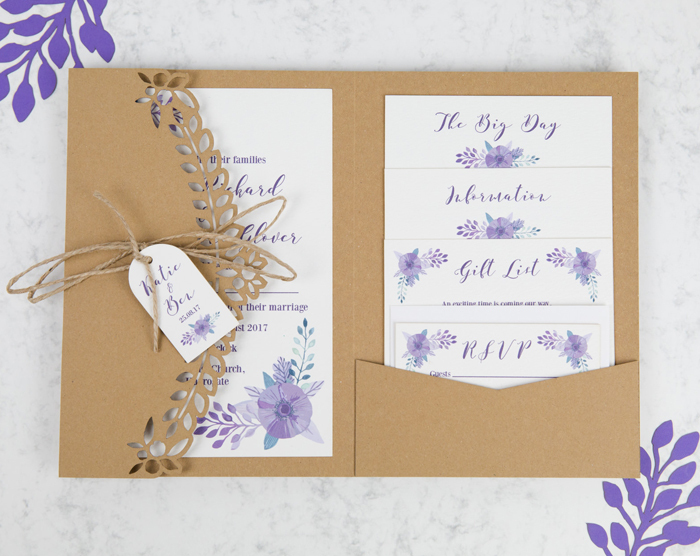 No, there’s no minimum order, however, the bespoke design fee would remain the same whether 10 or 100 invitations were required, making a larger order much more economical. Once a job is complete, our standard delivery charge for large orders of stationery is £10 for next day, tracked & signed for delivery. Delivery costs for smaller items will be based on size and weight and are usually no more then £2-£5. Yes, as long as it’s between our standard business hours (Monday – Friday, 9am – 5pm) we’re very happy for customers to collect. Once your stationery is complete, we will be in touch with directions and to arrange a suitable time. What is your cancellation and returns policy? Unfortunately due to the bespoke nature of our stationery, we are not able to accept returns. Please notify us as soon as possible if you wish to cancel or modify an order that is currently in production. Once a design has been signed off by you, refunds and amends are not always possible and will be made at our discretion. Please complete the form below in as much detail as possible and we will be in touch as soon as we can. Please refer to our colour chart for available options. Please let us know of any theme, style or inspiration you may have. Copyright © 2018 Pretty Neat Studios. All rights reserved.